*NEW MOON* in the last degree of Aquarius moves right into the first degree of Pisces. We move between worlds, we transition between chapters. This liminal NEW MOON marks an important transition. The coming together is imminent, the sacred union between Mars and Venus is on its heels, and the conditions for initiation into wholeness are ripe and ready for the taking. Step forth, step through, keep going, keep releasing and keep opening. “The second New Moon in Aquarius…is exact on Wednesday, February 18th 2015 at 3:47pm PST. “This especially potent New Moon is not only at the last degree of Aquarius but it is in the last MINUTE (29’59 Aquarius)- with the Moon moving into Pisces less than a minute later and the Sun following suit three minutes after the lunation. “…Wherever you are at on your path- this New Moon meets you there and can take you further. “…It’s about fully embodying our Light and our humanity- and as we do this for ourselves we contribute to the collective healing of the split in the world around us. “There are several significant aspects to take note of in the New Moon chart. The New Moon is exactly semisextile to Mars at the very last degree of Pisces- the Omega point. He shifts into the first degree of Aries- the Alpha point- the very next day and Venus will follow suite the day after. “Both Venus and Mars are heading into a very auspicious conjunction in the first degrees of Aries, exact on Saturday the 21st, opening up a lot of creative, passionate, Eros energy (which is about Love of life, not just physical lust and sexual passion). “With both Venus and Mars in aspect to this New Moon (with Mars being almost exact)- we have the Divine Lovers channeling their fertile, passionate and creative energy into this lunation. “We have the power to birth something at this New Moon– be it a new life, a new direction in our lives, a baby, a creative project or a new awareness personally and collectively. “We have the visionary capacity of Aquarius teamed with the compassionate, altruistic energy of Pisces. The last two signs of the zodiac are most concerned with the plight of humanity and are focused on raising consciousness and realizing Oneness with all that is. “These very huge energies are available to us now and they can come through in strong or subtler ways- but regardless of how they show up, they are most definitely there (and worth tapping into). “…The New Moon also activates the Saturn/Neptune Square and the Uranus/Pluto Square…This brings up the disparity between dreams and reality, ideals and what is actually manifesting today. This is an aspect of spiritual crisis but also spiritual mastery. “It’s interesting to note that this lunation has two ruling planets- Saturn, the ancient ruler of Aquarius, and Uranus the contemporary ruler. Both of them are involved in potent square aspects with outer planets and both of them aspect the New Moon! “This brings two very polarized focuses front on center: how to bridge the mundane world (Saturn) with the spiritual world (Neptune) and how to know when to let go (Uranus) and when to hang on and/or transform something (Pluto). “…This powerful New Moon can initiate many things- and it up to us to set our intentions and choose the direction we want to head into. New Moons are like seeds, they need to be planted and fertilized and tended to with care. “The potential inherent in a New Moon is not fully made manifest if we do nothing with it– or if we start to do something with it and then we do not follow through. “So take time during the days before this New Moon, during the dark Moon, to get clear about what you are ready to release and what you are ready to call in and what you are ready, willing and able to do about it! “The realizations possible at this New Moon and the things set into motion during the upcoming lunar cycle are huge. But they will only be revealed in their fullness to ‘one who has emerged successfully from his/her metamorphosis’. “Nessus…can show where we want something so desperately, we are willing to go against all rational. He can indicate something that we feel was taken from us and also where we seek to reclaim what was lost. “…This Moon reminds us that the line between one sign and another, the line between one person and another, is a man made concept. Clearly, there is no division. “Yet here, as Aquarius takes its last gasp of breath, its energy becomes more animated. The last degree of any sign is where the energy is unstable, caught in the last burst of light before the end, it displays itself in all its glory. “The danger with this Moon is that there can be a tendency to dig your heels in. Maybe you are locked in a dispute with another or maybe it’s an internal battle. Maybe you want to wildly rebel or make a point just to prove you are you and they, who ‘they’ are, have no power over you. “But the square to Saturn reminds you that these are growing pains – like the emotional displays of a teenager as they slip from child to adult. It’s all about perspective. “As I write, I get a flash of one of those amazing 3D pavement drawings. Seen from one angle, it may seem like you’re about to fall into a giant crevasse or you’re walking on a type rope. From a completely different angle, it’s just a flat drawing, no danger, no fear. “With squares and semi-squares and an Aquarius edge, it’s all about the angles. It’s the way you look at things. As you get older, your perspective changes. Over time you hear different opinions, read different things, gather new information. Maybe flashes of insight change your thinking. “This Moon challenges you to find the blurred lines in your own life. It asks you to look at where you point the finger, where you blame, where you deny your own power, where you project it onto someone or something else. “This Aquarius/Pisces energy combines our Collective Mind and Heart, helping us slip into Pisces’ unified field of Love and Compassion. “Neptune, Chiron, Venus and Mars are also in Pisces, opening the veils between multiple realms of consciousness. We need a strong sense of our Soul to contain all these possibilities. “If we are going to emerge into a new reality, it is a reality where we recognize we are all one; we are one with the Earth and all of Nature, we are one with the Cosmos and we are one with the Quantum Field of Light. We are Light beings, and we have to start living in that knowledge. “Our psychological childhood is over. It’s time to take our place as adults, not only on the world stage but on the cosmic stage as well. “The Sabian Symbol for the Sun and Moon at 30* Aquarius reiterates this theme. “This image speaks to a multiplicity of individuals with a unity of consciousness. In this state of consciousness, we are called upon to inhabit the totally of our Being. “We have to step into our wholeness to achieve our life’s purpose. The world needs us. And our souls long to live out our destiny. 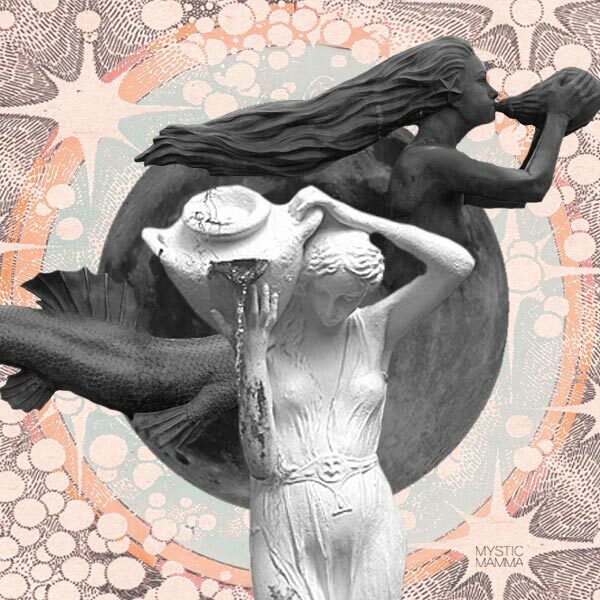 “The New Moon occurs at the mid-point of the Uranus/Pluto square…It unites these two archetypal energies and offers us the opportunity to bring them together within our own psyches. “Mars goes into Aries on February 19 and Venus follows him on February 20 and they meet up with each other on February 21-22. This is the Hieros Gamos, the Sacred Marriage in the heavens. You can see both of these planets in the western sky each night. Good out and look. Love and Blessings to all on this potent and activating NEW MOON and HAPPY NEW YEAR OF THE WOOD SHEEP! Once again, this is frighteningly relevant. Thank you so much for sharing. Amazing time. I am feeling the YinYang energy. Both calling it forward yet in resistance to it. A very push/pull dynamic is going on within. My affirmation, “I bring peace to all corners of my life”. coming upon this site has proven very beneficial to me especially during these times, im a 23 year old zodiac cancer male living in nyc with my scorpio girlfriend of 8 years. recently we have rode life’s roller coaster, we found ourselves coming into contact with moments you thought you would never live. we both experienced the outcome of what only negative energy and outlook on life can provide. i know it was me all along, i had experienced times of what positive energy and action would bring, and in those times i was feeling closer to the universe than ever, with a clear mind, and compassion for anything. recently ive become so in tune with this positive way of living and feeling, and it certainly is a feeling like no other. i find myself walking down the street smiling now, its just so strange to me what this feels like…. because as i said , i was almost at the bottom, and with help from this site i was able to find my positive light and was granted another shot. i started my metamorphosis and im happy to say i will be focusing my thoughs toward the new moon’s intention this wed feb 18 2015. i hope everyone makes sure to preform a ritual of some sort. i plan to follow one found on this site. Dear Matthew~ Thank you so much for sharing your journey! Much love and blessings your way! My birthday is the 19th, the day after the new moon. This site was so helpful gaining insight on what this moon means.. I’ve searched through several sites. This one was inspirational. I was in a bad car accident a year ago, it’s a miracle I’m still alive. I had to teach myself to move my legs alone, let alone walk. And through that darkness I was able to see light. I’ve always been a very spiritual person. But after the struggles I endured in the past year, it’s made a beautiful transformation on psyche. I’ve recently been speaking to the universe in many ways, and the cosmos have heard my calls and even answered many. Reading this, proves to me events that have been taking place, are all unfolding because the universal changes that are coming. I have felt an awakening in my soul. And this in itself, explains so much. It was beautiful. Dear Margie~ Than you for sharing. Your story is so inspiring. Holding you in the Light and may you continue to be guided into full healing and wholeness. Many Blessings! I hope to “come out of the birth canal and into the light”, and prepare to do my best to make this happen. I have just this last 8 or 9 months had a very difficult time in my lifelong relationship. I still do not know if we will make it through together, but I hope so. Thank you. I am due with my child on 2/25 and so this is relevant to me in so many ways. Thank you. AMAZING!!! My birthday is On this day and I was born on the time is suppose to emerge. Scary, but happy and peaceful to accept evey single blessing after 40 years of craziness. I’m looking forward to be 41 with a new LIFE!!! me too – actually feb 16th but at 10-10 pm- happy birthday to u too! I know of 2 babies to be born any day. Boys? Wow! I’ve never responded to something like this before – but I found this too pertinent not to share. I’m turning 30 on Feb 18th, an Aquarius/Pisces cusp myself and both my Mars and Venus are in Aries! It’s incredible because I am so not a birthday person, but after reading this and the comments of you other brave souls I am inspired to make my day last through the 21st-22nd because I am entering into a totally new phase of this journey – caterpillar / chrysalis / ?? This was amazingly relevant and so supportive! Thank you! Namaste! I was laid off 4 days ago and had to quickly change my perspective about how I view life. This information on the new moon comes at the perfect time. This is the first time in my life where I’m venturing out into the unknown. I have no clue what is next, it’s scary and thrilling at the same time. Thank you for all of these wonderful insights. My word of the year is surrender. Something I have never done before. It doesn’t mean I’m giving up the fight, it means I’m giving in to emotions, changes and won’t resist. I surrender to what is happening. The angels are smiling at your dedication. Lets Go ReBirth and LOVE is all we need. STEP IT UP FOLKS! I am an Aquarius born on the 6th of feb. I Really want to become a musician and i play guitars exceptionally well. I want to make it to that stage and have thought about it for a long time. Is there any rituals for the new moon we have to do? I come from Nepal and so have not got much exposure. So if anyone has any ideas please reply. And i will try my best! Tomorrow is my 67th birthday. It is also Ash Wednesday. I was born on a Wednesday, but not on Ash Wednesday (which was on the 11th that year 1948). I did some checking on the ‘Net, and it looks like the only other Ash Wednesday birthday I’ve ever had was when I was five years old, in 1953. My dad wrote some books on astrology, but I don’t really understand this article. I always try to limit or eliminate caffeine on the New Moon. I also try to be alone and do things I like, with no expectations. It’s kind of like a little mini-metamorphosis each month. I have some psychiatric and psychological problems. Sometimes I have to de-stress. Thanks for the article. It’s a good one, though — even though I don’t understand it much. I cannot tell you how incredibly relevant this is to me at the moment. On a whim a few hours ago, I just had to get out of the house and go for a run. This is quite unlike me, so I knew that something bigger was at play. I think for me it’s all summed up by, “Our psychological childhood is over. It’s time to take our place as adults, not only on the world stage but on the cosmic stage as well.” Yes, I really think this is time. The power of this New Moon is just incredible. Thank you thank you for encouraging me forward through this assessment and forceful steps to end what’s not working, what’s a multi generational victimhood and exploitation. Nothing could be more true – the clear assessment of what is not working, deep restructuring to take responsibility for a whole me and turning toward finally finally learning to receive nurturance, take responsibility, and grounded growth. I actually cried with joy to hear these words of encouragement that my drastic steps are on the right path and that the dark days are ending! Thank you thank you. Thank you so much for this. I feel more inspired to follow through on all that I have in front of me this year. I feel that I am coming out of my cocoon, slowly but surely, and with a renewed vigor to face whatever comes my way with more intuitive awareness and mindfulness. Thank you for compiling all this. The last few weeks I have had the blues, feeling confused about my spiritual life and my time with my lover. I have changed but I kept trying to be who I used to be and was familiar with. The old ways of relating are superficial, conditioned responses and I know this now but how to relate now depends on being aware in the moment and letting the natural venus love come through. Mars is a mystery to me and thats OK today. They still love each other and LOVE is bigger that the fear that comes with not knowing. 19 February, happy birthday to me..
my birthday is 222 and I am very excited about this article. I am also excited that I have written a intention list, that I’m working on right now. I am excited to open my new life!!!! I can’t wait to share with you all. my mind travel from space to the universal conciouness without stress but activating the inner power require a talisman. Hi thank you very much. My north node real is on 0.12 pisc and true north node on 29. Acuarius in 9 th house. On 29.35 and 29.47 are in natal chart moon an neptune in scorpion. …Very confused and scared at this point in time. Hello MM. Thanks a lot for sharing. Through my perception, the resonance of your writing is huge. Something interests me: the rituals. Do you have some practices to build our intentions during the new/full moon? Thanks a lot. Love from France.